Creating an environment that is pleasant and exciting allows us to grow bigger affection towards our dwelling place. For that very reason, Allenians gathered together for two consecutive nights from September 17th to 18th in their efforts to adorn the hallways of Allen International House. “Adorning Allen” program is a long-term program that works on different projects each time throughout the semester. In the spring semester, “Adorning Allen” decorated the walls on the fourth floor by painting a wish tree that represented all the wishes the freshmen in Allen House had at the beginning of the year. 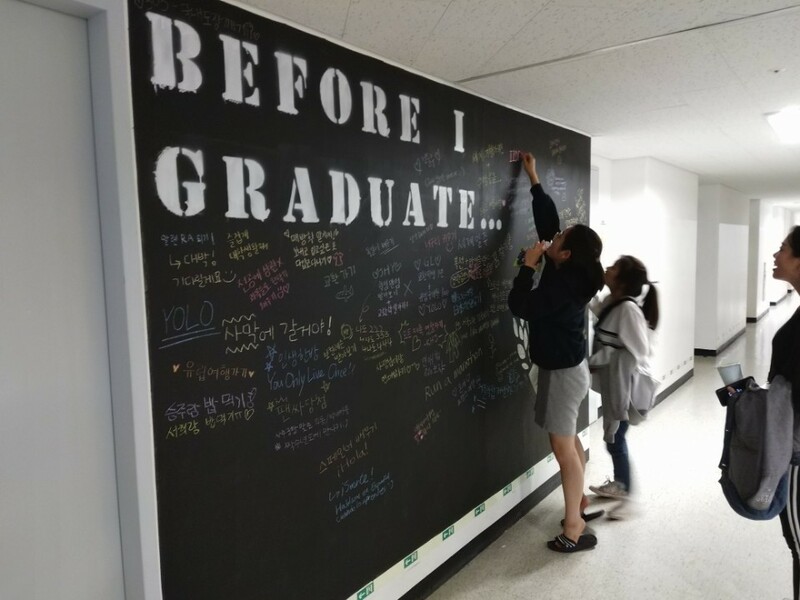 This semester, “Adorning Allen” focused on the third floor of Allen House by creating a huge “Before I Graduate” Wall at the entrance near the elevators. This wall is an adaptation of the famous “Before I Die” Walls that are painted in streets all over the world. “Before I Die” Wall is known for its uniqueness in that pedestrians can freely participate in writing their dreams to accomplish before they die on the walls with chalk. 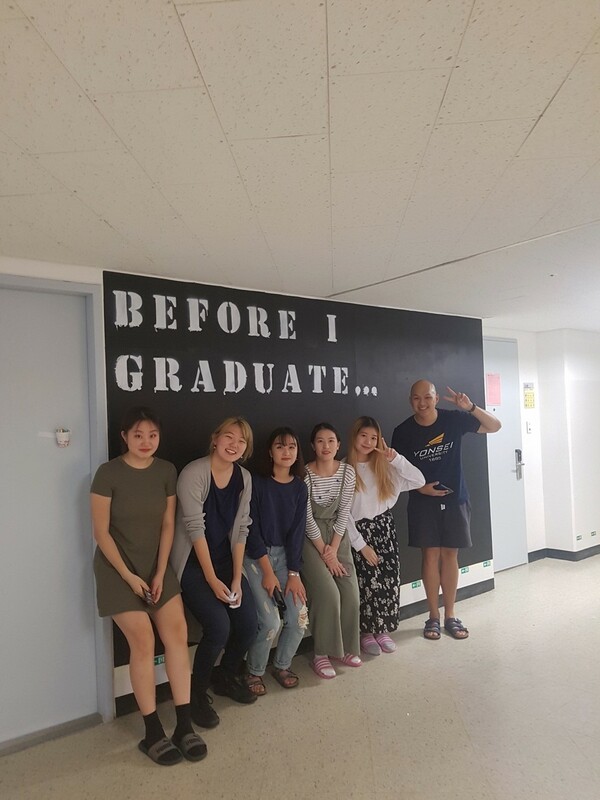 The RA’s in Allen changed the name of the program to “Before I Graduate” in order to encourage students to think about the things they would like to accomplish before they graduate from Yonsei University. By creating a bucket list together on the hallways of Allen House, the Allen community will be able to enjoy looking at all the different wishes their classmates have and have a better time appreciating the newly decorated, colorful hallways. By plastering chalkboard paint onto the wall and using hand-carved stencilsand spray paint, the students in Allen worked extremely hard to complete this rather grand project. As soon as the paint dried, groups of students filed in to write their wishes on the chalkboard walls that night. Within one night, the wall was filled with the wishes of students. Allen House plans to leave the wishes up for the rest of the semester to remind students of their dreams and reuse the wall next year by erasing the chalk and resetting the space for the next incoming freshmen.